The last surviving Aston Martin DB5 from the film "Goldfinger" is being sold at auction. Image from Wikimedia Commons. It was recently announced that the original Aston Martin DB5 from “Goldfinger,” a James Bond film, was going to be auctioned. It is the only surviving prop car from the film left intact. The car is expected to sell for at least $5 million. That makes it easily one of the most expensive cars in the world. 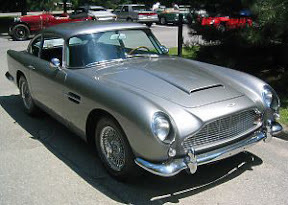 Given the status the DB5 model commands, thanks to the film, it is one of the most famous as well. There is only one surviving prop car from the James Bond film “Goldfinger” left in existence, and it is soon to be auctioned, according to The Telegraph. The car selling at auction is the only model left from the film, and it is the one Sean Connery drives in the film. It was purchased in 1969 by a DJ named Jerry Lee, for $12,000, who had to do a lot of convincing to secure the vehicle. Now in his 70s, Lee is selling the car to benefit his philanthropic organization, the Jerry Lee Foundation. The car has been in storage since the 1970s, but it’s still is road worthy. Arguably the most famous car in the world, it is also one of the most expensive. The only other surviving prop car was lost. The car is expected to fetch $5 million at auction. Aston Martin has long been associated with the “James Bond” films as the “Bond car,” and vintage DB5 models command a high price as a result.